The Red Goo in action. This blog has been far too serious of late with editorials about stupid things happening in America, because stupid things keep happening in America, dammit. Dear stupid things, stop happening so I can stop writing about you. Thanks. To lighten up the party, today, it’s story time. Yay, story time! Grab a carpet square and gather round for the story of the blue goo. 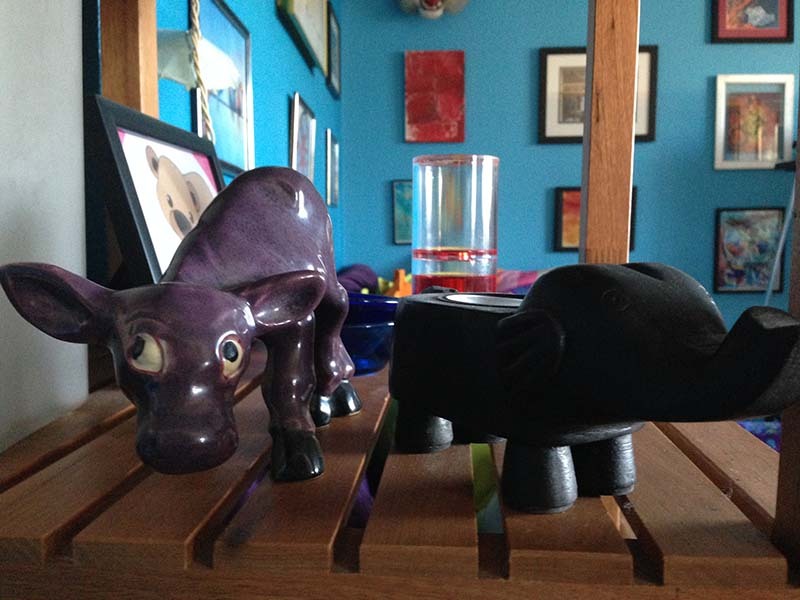 A long time ago, I shared this picture with you and told you that there was a story to the canister of red goo hiding behind the elephant and the purple cow. It’s a simple hard plastic canister. In the middle is a disc with a hole in it through which a viscous red goo can flow, like a goopy hourglass that is terrible at its job. My version of it is small and red, but once upon a time, there was a large canister of blue goo. The owner of the blue goo lived up north several hours away. My best friend and I would make the trek up there once every few months because the place he lived had magical properties. No matter how tough life was–and it was pretty tough back then–if we drove up north, there was fresh air and the smell of ocean that didn’t smell like our ocean downstate. The air was clean and tinged with pine. At night, you could see all the stars–all of them and planets, too. Among my friend’s possessions was a canister of blue goo. This canister of blue goo was much like the canister of red goo you see up there, but much larger, and well, blue. I fell in love with the blue goo that had a home near the pine and ocean. Every time I walked into my friend’s house, it was the first thing I grabbed. I loved watching gravity manipulate the goo. I found it relaxing and I could not go to sleep at my friend’s house without watching it flow for a while. One weekend, my best friend and I were up north, and while our friend was out making a living, we plotted a nefarious caper. We were going to borrow the blue goo and send it around the world. Another friend was leaving on a long backpacking-type trip in a few weeks. We would pass the blue goo along to him where he would take pictures of the goo in various recognizable places around the world, which we would send to its owner. Eventually, the blue goo would make it back stateside where it would once again live among the ocean pine, none the worse for its adventures. There might have been alcohol involved in concocting this plan. My best friend and I went shopping for kidnapping provisions. We bought a newspaper, a glue stick and a bottle of blue Gatorade that was the approximate color and dimensions of the blue goo. We cobbled together a ransom note from letters cut out of the newspaper, which we glued on a sheet of paper. I can’t recall exactly what the note said, but I know for sure that one of the ransom demands was pie. We left the note and the half-full bottle of Gatorade on the shelf where the blue goo normally lived and went back downstate. We expected a call right away, but our plan was botched almost from the start. In the landscape of his apartment, a half-full bottle of Gatorade looked enough like the blue goo that it was nearly two weeks before he noticed something was a little off and read the ransom note. By the time he called us up, laughing his fool head off, we had already made the transfer of the goo to our friend who was just about to leave for Russia. We feigned ignorance of the goo disappearance, of course. Two days later, we got a panicked phone call from our Russian bound friend. It seemed that the Russians weren’t too thrilled about a can of goopy looking blue stuff entering their country. Wanting to know what it was and why he was bringing it into Russia, they detained him and separated him from his suspect luggage. Meanwhile, at the airport, there was a protest. Things got out of hand and it turned into something of a full-scale riot, during which our friend’s luggage was ransacked and smashed. When he finally got his suitcase back, there were shards of clear plastic and a sticky blue substance covering all of his belongings. He sent us a picture of the goo carnage. He spent the next few weeks backpacking around with blue everything. He was an exceptionally good sport about being suspected of terrorism by Russian officials. He didn’t care about his stuff being destroyed, but he felt terrible that the goo was gone and he couldn’t take it on adventures. That left my best friend and me with the unenviable task of telling the goo’s owner that it had been destroyed. We figured it was best done in person and made plans to go up north at the weekend. In the meantime, we tried everywhere we could think of to get a replacement, but we could not find one. We drove up north like dogs who had just destroyed something–our heads down and tails between our legs. We told him the unfortunate fate of the blue goo and apologized. We tried to explain that they weren’t actually terrorists, but protesters, but he would hear none of it. From then on, the blue goo was destroyed by Russian terrorists. Going along with his fanciful embellishment was the least we could do. We gave him the picture of the goo remains from Russia. He still has it along with the ransom note. Years later, the owner of the late blue goo was visiting a friend back east. This particular friend of his was a big fan of personal space. I get it. I don’t like personal space invaders either, but she was pretty extreme about it. Something had happened that made her religious about the amount of personal space she required. They were sitting in her living room across from each other when the goo’s owner spied something on a shelf just above her head that looked remarkably like the blue goo. In his excitement, he forgot about her personal space requirements. He stood up quickly, and with two arms outstretched, he snatched up what was, in fact, an exact replica of the blue goo. “THE BLUE GOO! Where did you get this?” When he looked at her, he was surprised to find her trembling and horrified. She was rather in a state of shock to have been so nearly assaulted, or at least, that’s how she saw it. He apologized, but she basically told him to take the goo and get out. Are you sure? Yes. He called her up later when she was calm and explained the story of the blue goo to her. He tried to give it back, but she told him to keep it. The blue goo’s owner was reunited with the blue goo once more. Years later, I was thrift store shopping, as I am wont to do, and found the little red goo pictured above. Even if it had been a thousand dollars, I would have found a way to buy it, but it happened to be less than five. Some people just don’t recognize the value in things. Now I have my own goo and the goo balance in the universe is once again restored. Posted in funny business, stories and tagged shenanigans, stories. Bookmark the permalink. So what is the goo, anyway? Is it just a cool ornament? This all happened before the Sept 11th attacks, so they weren’t nearly as strict, but yeah, we probably should have surmised that the Russians wouldn’t like the blue goo. I have no idea what it is really. It’s like a lava lamp but without the lamp part I suppose. Cool ornament sounds about right. I don’t think I’ve ever come across a canister of blue goo, red goo, or any other color goo. What I visualized from your description of “watching gravity manipulate the goo like the world’s slowest hourglass,” though, is the relic from the 60s and 70s known as a lava lamp. And these, too, came in colors, mostly some sort of Day-Glo colors. And I recall, when I was quite relaxed (if you get my drift) sitting for hours just watching the shape-shifting of the blobs of colored wax inside the lava lamp’s glass container filled with clear or translucent liquid heated by the incandescent bulb inside the lava lamp’s base while listening to Jimi Hendrix or Janis Joplin on the stereo. Far out, man. Groovy! I know. I loved that lava lamp. And the stuff inside is sticky as all get out. It made a huge mess. Now that’s one gooey story! That was actually pretty neat about Russia, I too wondered how he would get through customs. Guess that answered that! Great story Goldy. I loved this story, Goldfish. It made me smile and I really needed that. Yay for blue and red goo! And pie. Yay for blue goo, indeed! I am also of the opinion that it’s a good thing to have things around you that are priceless in terms of the memories, but are so expensive that you don’t dare pick them up and hug them now and then. Most of the things in my room are priceless in a personally historical sense, but are of little value otherwise. How about some goo in the stew? “Some people just don’t recognize the value in things.” – The perfect line for this story! Some people live in a blue goo state, some people live in a red goo state. Sign me up to live in a purple goo state. My teacher has a blue goo and my whole class loves it. I want to get one for my friends birthday and have no idea where to get it. What are these gooey hourglass things called? I’ve been trying to find them on amazon but I don’t know what they’re called. Honestly, I’m not sure. I saw something along the same lines listed as a fidget toy. Good luck.